Hello friends. I've made crocheted Christmas Tree ornaments I'd love to share with you. Last month I was so busy crocheting these for family and friends. I really enjoyed making these crocheted Christmas tree ornaments. It's fun using different color combinations with the yarn. Below I have all the details to make these ornaments. These ornaments are so quick and easy to make and will look so cute on your Christmas Tree. These would even look cute attached to a gift package. How about making them into a garland for your mantel or tree? The yarn I used is from Lion Brand Yarn in kitchen cotton. You can use whatever type of yarn you like and colors. You can use an H or I crochet hook. 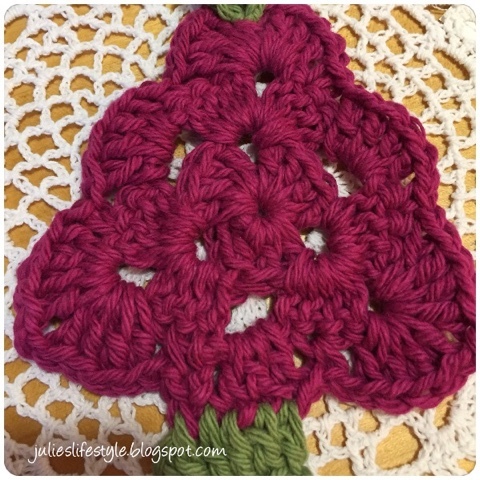 To crochet your own ornament you can use this PATTERN I found on Pinterest. 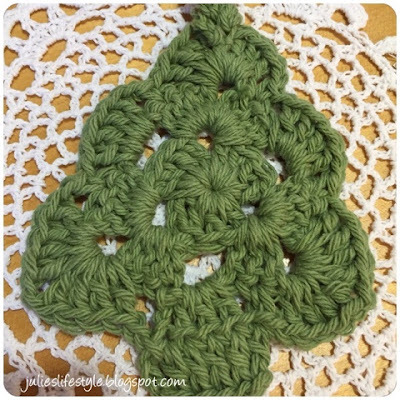 For my blog friends that enjoy crocheting, I hope I have inspired you to create your own Christmas Tree ornaments. They make nice handmade gifts for family and friends. It's so simple and beautiful! I agree, they probably make a really beautiful gift tag! They look fantastic. I especially like the one in the two colours. I like the green tree but then I am a traditionalist!! One of the young ladies at my house last night for a party crochets and I was showing her some of my crocheted things from friends. I love the way crafters enjoy looking at another's work!! SO beautiful, Julie. I always enjoy a peek a what you're making!! Very pretty, loving the red one !! Thank you for another fun project, Julie!! This is SO cute Julie. I am sending it on to my needle crafty friends. It's a lovely pattern Julie! Thanx for sharing! So cute!! You have been busy! Cute ornament, Julie. Looks like a quick and easy pattern, too. Too cute!!! Thank you for sharing Julie! Sooo cute Julie. Have a wonderful rest of the week. These are beautiful! I am enjoying mine :) Thank you so much for the sweet trees and stars! They are adorable, Julie! I'm sure your family and friends will love them! I love making things for family and fiends. Your crochet Christmas trees are so cute and such a perfect little gift too! What a cute pieces! Wishing you a fabulous Sunday.. I really like these. So pretty! Hi Julie, just popping over from Brag About It to thank you for linking up with us this week and sharing your adorable crochet Cristmas tree! Wishing you a wonderful Holiday Season! Beautiful Julie, thanks for sharing with Hearth and soul blog hop, pinning, tweeting and featuring on this week's hop. What a sweet Christmas ornament, Julie! It's lovely crafts like this that become heirloom ornaments! Thank you so much for sharing with us at the Hearth and Soul Hop.